Training Wheels: THIS is inclusion! Rock on!! THIS is inclusion! Rock on!! 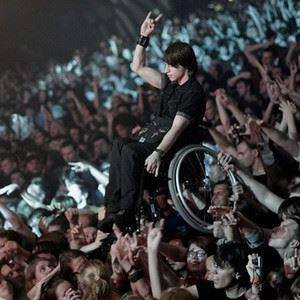 This photo came from a Facebook post from a group page called, "Handicap This". I do not know the person or what/where the concert is. Hi everyone. Been a long time since last post. Sorry but have been really jammed with doing great things and literally not time to post as much as I was writing a few months ago! Just a quick review of what I have been up to and a short blog "blog- opinion". Here is my post and latest "blog-opinion". I was really inspired by the Facebook photo above. I see tons of stuff on Facebook that are "inspirational" or try to be such. Most of these types of photos and bits are token-izing of people with disability and frankly.....very sappy. This photo grabbed me by the arm and shook me.....THIS, my friends, is a photo of pure INCLUSION. Period. Maybe it is because I am a middle aged rock and roll fan. Maybe it is because I have spent my professional life as a social worker fighting with people to get those with and without disabilities a level playing field for life. Maybe it's because the guy in the picture is shooting the "horns" at the sky in true rock and roll glory. I just feel that this photo gives me lots of hope for the civil rights struggle to get people with disabilities joined with us all deep inside of our society. I feel this photo distills everything I have learned and heard and believed from the likes of; Ed Roberts, Dr. Beth Mount, Dr. Al Condeluci, John O'Brien, Michael Smull, Lynne Seagle, Norm Kunc and EmmaVanderklift and the countless other "inclusion-ites"!!! I Love this photo so much for so many reasons. Rock on!!! If interested, here is what I have been doing since March. Between April and May I have been working in Kansas, Vermont, Washington DC and all over NY State and NY City. I have worked with several agencies and have interacted and been with hundreds of direct support professionals. I am preparing materials to teach an online course for The City University of NY on Supporting Adults and Children with Disabilities. However, I have been working mostly on a really awesome Code of Ethics project with the NADSP (National Alliance for Direct Support Professionals) and The College of Direct Support/Direct Course Online featuring short films about the Code and using actors who are people who experience disabilities and direct support professionals...stay tuned on all that!! Hope to post a bit more often!